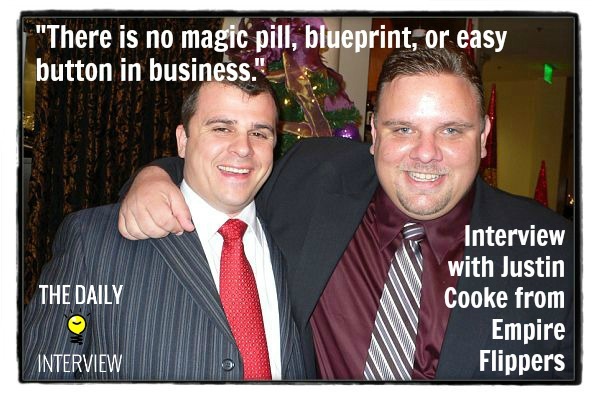 To kick off our FIRST EVER interview here at The Daily Interview, I am thrilled to bring you this interview with Justin Cook from EmpireFlippers.com. As someone who has been reading Empire Flippers since its early days (back when it was called Adsense Flippers), I was really excited to have this opportunity to interview Justin. Justin and his business partner Joe have been running multiple successful businesses in the Philippines for the past several years. The business that they mostly feature at Empire Flippers is the selling of niche sites. They have a team that builds the sites, ranks them, and once they’re at a point of earning a decent amount of money, they flip the site for a tidy profit (usually). They are pretty diversified, however, so this isn’t their only source of income online. To put their success in perspective – they’ve generated between $25,000-75,000 in each month for 2013. I love their transparency, as they break down this income each month within their income reports. Justin, I know you and Joe run/have ran multiple businesses, but today I’d like to focus on Empire Flippers. You guys have an excellent blog and podcast, and offer a unique perspective when it comes to selling websites because of the way you’ve scaled your business. Tell us a bit more about yourself and your business – How did you get started in the internet marketing industry, and where is your business at today? I know you have a lot of projects in the mix, but we’d love to hear about what you’re currently most focused on. Joe and I both live and work in the Philippines. We moved here when we “outsourced ourselves” from our previous employer and created an outsourcing company to provide back-end services to support their efforts. They ultimately scaled down our work and we were constantly looking for new projects and clients to replace that income. Towards the end, they shut us down completely and we had a well-trained staff but no work for them. We tried out a couple of different things (Mechanical Turk, niche site creation, etc.) and were hoping that we could just cover their salaries until a “real job” came along from a paying outsourcing client. Ultimately, the creating and selling of niche sites ended up being the thing that worked. We started explaining our exact process on our blog and podcast, finding it really resonated with people. You can find out a bit more about our early story on our About Us page or on this podcast episode. In 2013, we wanted to re-brand ourselves and target a larger market. We made the switch from AdSense Flippers to Empire Flippers, added products and services that supported others looking to build an online empire, and eventually opened up our marketplace to allow others to sell their sites once they’ve been vetted and approved by our staff. Through 2014, we’re continuing to improve the value we offer to site buyers and sellers. We’re known for selling sites in the $100 – $500 per month range, but we’ve spent the second half of 2013 vetting and selling sites in the $500 – $3K per month range. This will continue through 2014 as we continue to apply the feedback we get and improve the value and quality of the sites and services we offer. Looking at your journey, what are you most proud of? What has been your greatest success (or successes) so far? Aside from revenue, getting feedback from other entrepreneurs who have absorbed and applied our suggestions to find success is pretty awesome. We have podcast listeners that have nothing to do with building, buying, or selling sites that still tune in for our info on hiring and building overseas teams, setting up systems in your business, marketing as non-marketers, etc. We had a listener apply our tactics from this podcast episode that ended up getting featured on an industry-leading blog/podcast and earned him thousands of dollars in additional profits. Another said that the information shared by both Smart Passive Income and Empire Flippers was enough for him to be able to pay his way through University. That’s the kind of feedback that helps me out when I’m having a particularly rough day, struggling to write, etc. On a more personal level, I love the fact that we’re able to give back to others in need here locally in the Philippines. We’ve put on a charity boxing event, run a Christmas Gift Project every year, and recently set-up our our KIVA team for Empire Flippers. (KIVA is a micro-lending institution that allows you help finance others around the world that don’t have access to banks or capital you or I might have.) Helping out other entrepreneurs here in the Philippines that are making their way in the world is awfully rewarding. We’ve all struggled at one time or another. Which failure was most significant for you, and what did you learn from it? My first (real) business was a 3-way partnership in a mortgage company that included Joe and another close friend. We didn’t have our roles clearly defined going in and probably partnered out of fear of going-it-alone rather than a great match of skill sets and expertise. When our third partner started working less and less we tried to define our individual roles and found that he just didn’t have the ability (or drive) to complete his tasks or goals. We were all getting paid the same and there wasn’t any way out, so we all ended up playing the “Who Can Work Less” game. When you include the fact that the industry bubble was bursting, our business turned into a complete and utter failure. These issues bubbled up through heated conversations, shouting matches, and a complete inability to discuss anything with each other rationally. In the end, our third partner left the business and we haven’t spoken since. Those times were very personal and emotionally draining for all of us. You wouldn’t believe how personal business can get until you’ve gone through something like that. I think those struggles still haunt our business today at Empire Flippers from time to time. There’s an ebb and flow that comes with working in partnerships where one partner works more for a while, another works less, etc. We’re now much better at recognizing the signs and discussing it before things get out of hand, but I think we’re both still very sensitive to this issue. It’s clear that there are definite pros and cons that come along with forming and maintaining a business partnership, and maybe it’s even more challenging with an online business where you may not always be in the physical presence of one another. All things being equal, do you think it’s a good idea to seek out a partner when you’re starting an internet venture? Obviously, there are a lot of factors in making a decision like this, but do you think the pros generally outweigh the cons, or is your relationship with Joe something exceptional? Joe and I have said quite a bit and have been quite harsh on partnerships in general (Example 1, Example 2). It’s not that they’re always bad, it’s just that they all have the potential to end up that way. It’s true that a business partnership shares many similarities to a marriage which is what can make them so difficult (and rewarding). I think that, more often than not, you’re better off starting your business first and worrying about a partner later. If you get something going and find you’re lacking a particular skill set, you can always hire further down the road. (And not have to give up equity) If you’re not able to get anything going or any traction, it’s unlikely you would have been able to do so with a partner anyway. If you choose to add a partner down the road (see Dan Norris at WPCurve) you’ll be coming from a position of relative power and be able to shop for and find the co-founder you really want/need. If you’re considering partnering with an old friend or co-worker out of fear of going it alone, I don’t think that’s a very strong position to start from. Keep in mind this is a complex subject and I’m far from being an expert on this – just sharing my experiences in my own business and working with others. This is a hot topic right now, and I think you’re one of the people best suited to address it. While content-heavy, “authority”-style websites are obviously more valuable and offer longer term potential compared to smaller niche sites, there’s obviously more time, cost, and risk involved. Where do you see the future heading with these two types of sites? Will smaller niche sites always have some relevancy (and value), or do you think people (including your business) will need to put more of their focus on creating sites that have more content and a larger social presence? Smaller niche sites: Anything from a 5-10 page starter site to a 50-100 page niche site. You could debate those definitions of course, but we’ll go with that for our purposes. The only thing that doesn’t seem to last is the tactics used to promote, link to, or build traffic to the sites. One day it’s using public blog networks to boost your backlinks and rankings. The next it’s private blog networks that aren’t as easily detectable by updates like Penguin. Then it’s networks of social accounts promoting traffic, giving references, etc. Someone looking to get started building niche/authority sites needs to use the strategy that best matches their interests, skill-sets, and budget. One thing I think I should clear up – some argue (maybe even us when we were starting out) that having worse content will improve your CTR, revenue per page, etc. We can say anecdotally that, over time, it doesn’t seem to be true. Sites that have great content don’t necessarily under perform those that have bad content. In fact, it seems that choosing an easily monetized niche and having closely-matched advertisers is much more important when it comes to AdSense. No matter the strategy you choose, having content on the site that helps the user directly will be better in the long run and is in line with what Google’s looking for, no matter the number of pages your site has. Let’s take a step back and look more generally at building and/or selling passive income-generating sites. I know you have a lot of great advice to share, but If you had to take your best advice and put it into one sentence or phrase, what would that be? LongTailPro – Our go-to for keyword research on just about everything we do. ZenDesk – We use for all company support. It’s not cheap if you have a larger team, but it solves a big problem for us. Ontraport – Next-level email auto-responder software that allows for marketing automation, auto-sequencing, etc. For someone who is just starting out creating a blog or trying to build successful niche sites, what advice would you offer? What do you wish someone told you about when you first started? It’s great to tell a story and to use personal examples, but keeping these two things in mind will help you focus, keep your content on track, and ultimately win you more readers/listeners. Traction/Momentum Is Easier – Seth Godin talks about the spoils that come with being #1 in your niche. That’s much easier to do if you’re focused on becoming the “Amazon affiliate niche site guy” rather than the make money online guy. Easy To Get Referrals – A friend of ours considered himself a marketing consultant, but that was so broad and vague I struggled with understanding who his clients might be and who I could refer to him. As soon as he became the “Ontraport Setup” guy, I knew exactly what he could help them with. Leads Are Cheaper – If you’re broad in your scope, you’ll be competing with major companies on paid keywords, traffic, etc. Thanks so much for the amazing interview, Justin! SO much good information to absorb here. Please leave us a comment below – what did you think of the interview? Do you have something to add to anything Justin discussed? Thanks! Great interview, Eric, and congrats on your new site! Flipping websites is something I’ve considered for several years but haven’t found the time to do. I even tried to sell one of my own affiliate sites on Flippa maybe a year ago…alas, no takers. Thanks Halina! Flipping websites definitely seems to be something that requires a lot of careful planning and patience…more power to those who are able to do it successfully. First comment! 🙂 Great interview. One thing I would like to ask you is what do you consider a low-medium competition niche and can you name a few examples? Thanks for commenting, Kurt! Low-medium competition niches are probably more specific versions of broad niches, if that makes sense. Let’s say your niche is health – in general, very competitive. Break it down to dieting…still incredibly competitive. Low carb dieting…competitive. Low carb dieting for children…now we might be looking at something in the low-to-medium range. Sometimes the key is taking a broad niche and breaking it down into much smaller pieces. Low competition in my own take has to be about a particular KW, that has the top 10 sites ranking Google to be weak sites that can be easily de-ranked and get your own site up there on google. So, it could be any niche. Infact, with lot of Google’s updates these days, I believe there are some tough niches before that would have stepped down due to the fact that Google de-indexed the ranking sites or penalized them. I agree, Sheyi – it definitely does have a lot to do with how easily a keyword can be ranked on the first page of Google. this is awesome Eric. I really think you hit something here. Congrats, can’t wait for more. Thanks Dustin – it’s going to be a lot of work to keep up with the daily schedule, but I’m up for the challenge. Hopefully I’m able to produce some really high quality, interesting interviews for people to read. Great interview in idea to do. I’m doing this also with Dutch (online) entrepreneurs and marketers, http://www.slagtermedia.nl/category/interviews/. It’s fun to do and gives your network a boost. I publish one interivew every week, and that’s quite a lot. But I hope you can keep up the pace! Cool, I’ll check it out – thanks Christian! Big fan of both the 4 Hour Work Week and Empire Flippers, so this interview was right up my alley. I actually have 2 or 3 sites in the next 4 months I’d like to sell and will be turning to Empire Flippers for assistance with that. Thanks for having them as part of your Daily Interview. Looking forward to others to come. Thanks Eric. Looking forward to helping you sell your sites, Kevin! I’m looking forward to checking out more. I’ve already read Tim’s interview and I’m interested to see who else you’ve lined up! Best of luck with the new launch! Thanks so much Justin for participating – your interview was awesome, and I’m honored to have you and Empire Flippers as the first. I feel the same way! Every time I read about the success they’ve had, I always think: “Hmm…maybe I should give niche sites another try.” They’re not for everyone, but these guys have really figured out a way to turn it into a very profitable business.